Anyone know of a peanut/nut free brand of wafer cookies? I would prefer white but I guess I could use the others. There is something I want to make for a party desert. If there are safe cookies similar size they might work. Does Nabisco make Sugar Wafers anymore? I think so. But their website is not working for me. I don’t think they sell them in Canada. I looked at Keebler's website and couldn't find sugar wafers on there. I may have to look for something I can bake to use. How are you using them? If you don't need the sugar from the cream filling, there is an ice cream cone made out of the same wafer stuff. I know there are more brands than Keebler who make them, this is not the kind of cone we buy. I was having a problem with the Nabisco site yesterday also. If I can find safe ones, I’m happy to ship. I’m going to cut and paste...using icing as paste....to make a desert that will also decorate the table. 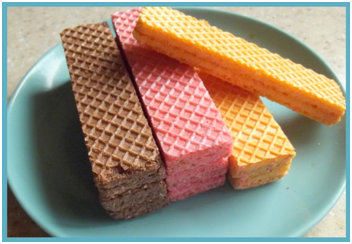 I would prefer these wafer type cookies, but today I realized, I can use Rice Krispie squares. When done, I will post pictures. But, it won’t be until sometime in June. Just realize....bonus with Rice Krispie squares....I can colour the melting marshmallows. Yeah! I'm interested to see the final product. Not sure why they aren't on the site but Keebler definitely still makes them, just ate them a few weeks ago.